This article is focused at the future of the Ontology network and therefore will skip over the basics. If you’re new to Ontology, I suggest you start with the Introduction to Ontology article. After a monster month in June, Ontology is preparing to launch its mainnet on June 30. They are also hosting a meetup in Tokyo on launch day. In this article we’re going to take a look at the road ahead. What happens after the mainnet launch on June 30? Will the Ontology team keep up the momentum? What will the team be focused on during the second half of 2018? Most token prices dump after the mainnet launch, and I wouldn’t be surprised if Ontology follows a similar pattern. That being said, there is a lot of hype around this project, and even during the current bear market the ONT token has remained strong. 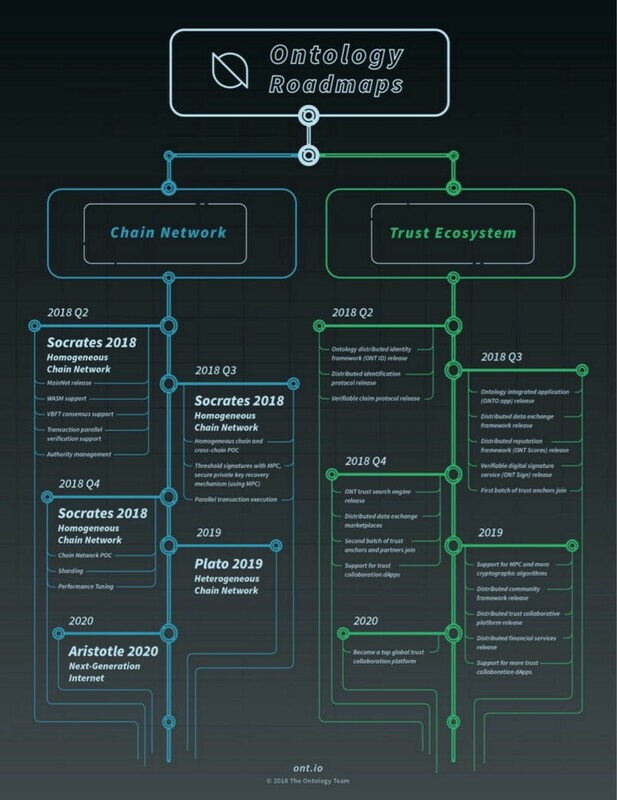 First, let’s take a look at the Ontology Roadmap, released in April 2018. Let’s be clear, Ontology (like most enterprise projects) is not going to create tangible benefits for organizations any time soon. They have so much infrastructure to build before businesses and governments will start meaningful adoption. Therefore, in 2018, Ontology is focused on improving performance of their consensus algorithm and slowly releasing new features of their ambitious platform. 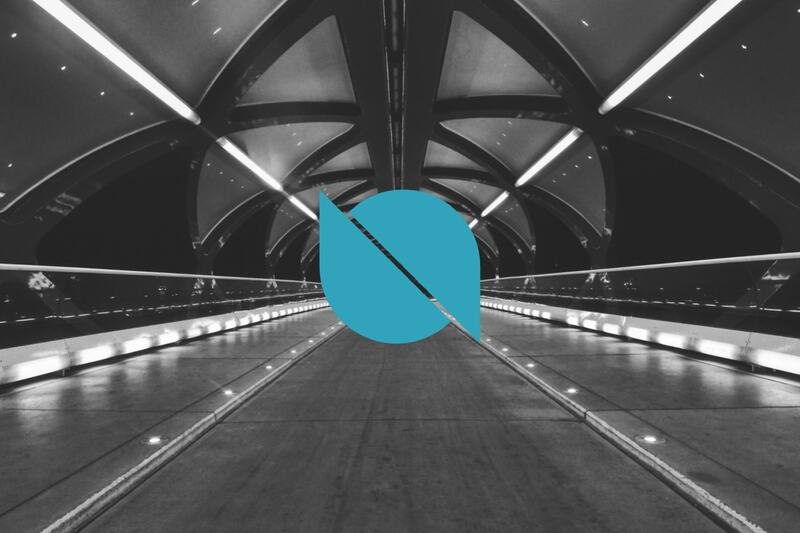 That being said, compared to other enterprise-focused projects, Ontology has a big leg up since their parent company (OnChain) has already started building solutions for enterprise clients. A foundational element of the Ontology network is a data exchange marketplace which enables the trust required to utilize digital identities. Imagine several organizations confirming specific data about an individual. If each of these sources all agree on a single version of truth, then your digital identity can be used with a high degree of confidence. Ontology plans to release the framework for this data exchange in 2018, enabling developers to create dapps that combine data sources from multiple organizations. Another foundational element of the Ontology network is ensuring interoperability between all parties in the smart economy ecosystem. The more easily (and securely) data flows between separate parties, the more value the Ontology network will bring. Ontology is essentially a public chain that connects many different private chains. Each private chain can use its own consensus mechanism (PoW, PoS, etc). To ensure these enterprises/governments will benefit from the entire NEO/ONT ecosystem, Ontology is releasing a cross-chain interoperability protocol. Both NEO and ONT are based on the DNA framework created by their parent company Onchain. In the ideal future state of Ontology, they’ll have a thriving ecosystem of enterprises exchanging data via their Distributed Data Exchange Marketplace (DDXF). Assuming a mature ecosystem, it will become challenging to source the specific information you’re looking for. In comes the Trust Search Engine (ONT TSE). In order for Ontology to truly scale to the level of their ambitions, they must successfully implement sharding. Their roadmap indicates they will begin the research process in 2018, and hope to be live with a sharding protocol by 2020. What is sharding? Instead of every node in the network validating every transaction, you break the population of nodes down into smaller groups called “shards.” Then each transaction is validated by a much smaller group, thus increasing performance. Sharding is considered a layer-1 scaling solution. No one has successfully implemented sharding, which puts some pressure on the Ontology team to figure it out. That being said, they have given themselves 2 years—hopefully by then multiple other blockchains should be live with sharding. It looks like Zilliqa will be the first project to go live with a sharding implementation, which is scheduled for Q3 2018. Ethereum and OMG are both working on sharding solutions for the Ethereum network as well. Think of ONTO as the dashboard allowing users to access the features/services of the Ontology network, such as digital ID management, digital asset management, distributed data exchange, etc. Additional features to be added to ONTO in 2018 include ONT Scores and ONT Sign. ONT Scores allows organizations to measure how credible data sources are. If the data initially added to the blockchain isn’t credible, it doesn’t matter how “secure” the data is. ONT Sign is a service that allows users to electronically put their “signature” on a piece of data. This can be used for “certifying data, forensic services, online arbitration, litigation proxy, and other derivative services and functions.” Blockchains are basically made of up “cryptographic signatures” and using this as a stamp of approval for business workflow makes complete sense. Besides building the technological infrastructure, the Ontology team is also focused on building the greater ecosystem. All networks are dependent on the strength of their ecosystem and this is especially true with Ontology. If very few companies or governments want to adopt the system, then the entire value proposition of Ontology fails. One concern is will developers join the Ontology ecosystem? They have started hosting meetups around the world, and released their community development specifications, but they still have a lot of work to do in this regard. Luckily, there is crossover with the NEO community which already has a healthy developer community. So far Ontology is laying the groundwork for success, but it will take many years for this drama to play out. In the Ontology ecosystem, trust anchors are partners that provide authentication services. Examples include: banks, universities, governments, biometric companies, etc. Ontology needs a healthy group of trust anchors if they’re going to provide a meaningful level of confidence with their decentralized trust network. Ontology is well capitalized which will help them make strategic investments. So far in 2018, they’ve already announced three separate organizations to support their ecosystem. Ontology also announced an Advisors Group (OAG) which will provide industry guidance. Over the course of 2018 and beyond, we should see some fruit from these investments. Ontology is looking to have a bright future ahead of them. Together with NEO, they’re positioned to become the backbone of the smart economy in China. While it might take several years before any real value comes from the network, it looks like the wait will be worth it. What do you think about the future of Ontology? Are you optimistic or do you think it’s overhyped? Note: Author owns a small amount of ONT from the NEO airdrop. This is not financial advice.